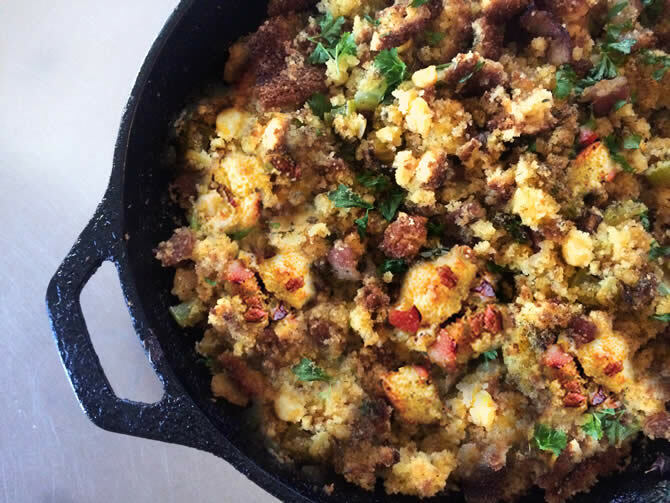 Plan for seconds with this delicious take on traditional stuffing. Hoffy bacon takes the flavor to the top! Prepare cornbread as per package directions and cut into cubes. Meanwhile cook bacon in a cast iron pan over medium heat for 2 minutes. Add onion, celery and chestnuts or mushrooms, sage and thyme. Sauté 10 minutes, stirring occasionally or until browned. Stir in cornbread, parsley and chicken stock. Bake covered in 350° F oven 20 to 30 minutes, remove cover for last ten minutes.